With the latest DVR and HD technology rolled into one easy-to-use unit, the DIRECTV Plus® HD DVR receiver will change the way you enjoy home theater. Enjoy up to 1080p HD resolution. 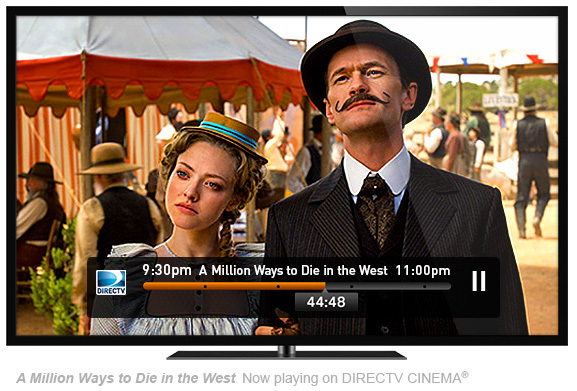 Record your favorite shows and movies in HD. Plus, take advantage of all the latest DIRECTV features like remote DVR programming from any PC or mobile phone, DIRECTV CINEMA and more. The HD DVR’s amazing picture quality takes your TV experience to a whole new level. And you’re in control over when you want to enjoy it. Record shows and watch them on your own time. Pause and rewind live TV. Fast-forward through parts of recorded shows you want to skip. It’s all in your hands. Experience up to 1080p HD picture resolution. Record two shows at once and up to 100 hours of HD content. Get access to thousands of On Demand titles (Internet connection required). Watch live TV on your computer, tablet, or mobile device (Internet connection required). Pause and rewind live TV for up to 90 minutes. Watch YouTube videos right on your TV. Control what you watch — back up, slow down or use instant replay. Get real-time scores of any major game at the press of a button. Control what your kids can watch with easy-to-use parental controls. Automatic Power Saving mode: Receiver goes into standby after 4 hours of inactivity. Share your favorite shows on Facebook or Twitter. Quickly find what you want to watch with any keyword. Set your DVR from anywhere with your cell phone or computer. Record a single episode or an entire series with a click.